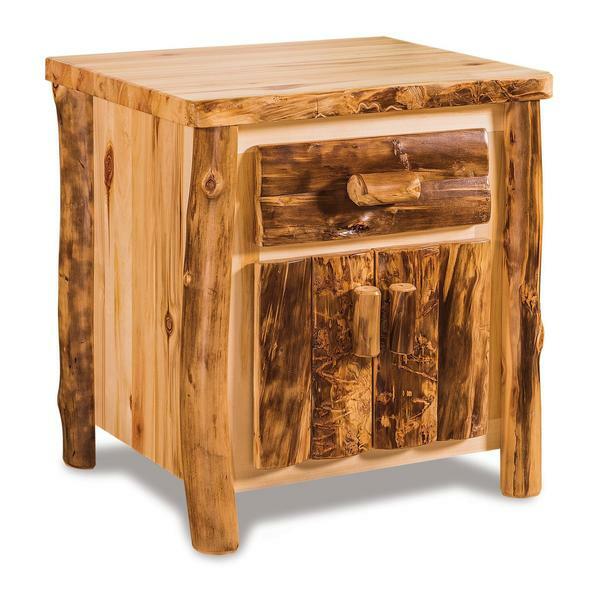 The Amish Rustic Aspen Log Furniture Night Stand comes in three different styles and sizes to meet your handy bedside needs. You can choose from the two drawer, three drawer or two doors and one drawer night stand and customization is available is you would like to create your own special night stand. This rustic aspen wood night stand is sure to offer you plenty of handy storage beside the bed with any of the three styles offered. Log cabin furniture will bring some rustic country style into your country or mountain home. If you are looking to order additional log bedroom furniture we also offer a wide variety of log beds, dressers, armoires and more. If you need help finding that perfect bedroom furniture just give us a call at 1-866-272-6773 and we are happy to help. That is what we are here for! We love our customers and helping them find their dream furniture.